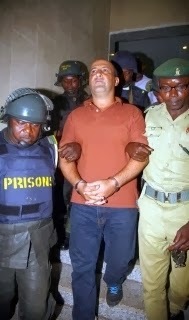 Nigeria's Federal High Court has sentenced a Nigerian-Lebanese, Talal Ahmed Rodah accused of belonging to Hezbollah to two terms of life imprisonment for an arms cache hidden in a concrete bunker under a home in the country's troubled north. Talal Roda was one of the three Lebanese men arrested in May 2013 for unlawful import and illegal possession of prohibited firearms. Mr Roda was arrested after a large cache of arms was found in a bunker during a raid on his residence. He was found guilty of all 5 counts of illegal possession of weapons and conspiracy. Two other men, Mustapha Fawaz, the owner Amigo Supermarket in Abuja and Abdallah Tahini, who were also charged with possession of illegal weapons. The three had been accused of plotting attacks against Western and Israeli targets for the Lebanese Shiite Muslim Hezbollah militia. Judge Adeniyi Ademola Adetokunbo freed two other Nigerian-Lebanese, Mustapha Fawaz and Abdallah Thahini, for lack of evidence. The judge said there was no evidence they received terrorist training and noted it is not illegal to belong to Hezbollah in Nigeria.